Old Dog Vestibular Syndrome; it’s not a Stroke! As humans get older, medical problems become more common and must be taken more seriously; the same is true with dogs. When dogs age, various systems begin to stop working as well as they did when they were younger. Some owners notice vision and movement becoming compromised. This may be evidenced as a dog that is slower to rise or sit, less willing to go on walks or stopping midway through a walk, less able to catch toy or treat, or fear/reluctance to climb stairs or get on the couch. Less obvious are the signs of hearing loss; in my own pet, her storm phobia diminished. She couldn’t hear the thunder and rain! While these changes can appear slowly and may go unnoticed, a frightening and acute ailment called Old Dog Vestibular Disease is also prevalent among geriatric dogs. Common signs are a sudden unsteady walk, sometimes listing to one side or the other, a head tilt, circling in one direction, vomiting, or rapid shifting of the eyes from side to side. In a geriatric dog, it’s easy for owners to assume a stroke, or reduction in blood supply to part of the brain is to blame. Others assume a brain tumor has caused the scary clinical signs, since we associate the brain with coordination and movement. Many times, the reason behind your dog’s impairment is a problem in the dog’s vestibular system and there prognosis is often good for a full recovery. The vestibular system is responsible for keeping both you and your dog upright and walking straight. This system is made up of the inner ear and parts of the brain and nervous system that work together to maintain a sense of balance. The parts of the ear and the brain work in tandem to interpret your dog’s sense of balance; were something to go wrong with this system, trouble in movement could result. How do we differentiate between the more grim diagnoses of tumor or stroke vs. the more benign ODVS or even a deep ear infection? First, if you see these signs in your dog call your vet and have a through physical exam performed which will include a complete medical history and thorough ear, heart, and neurological exam. Some diagnoses are reached by a process of elimination; ODVS is one. Bloodwork, imaging, and a urinalysis can give a complete assessment of your dog’s health; if no abnormalities are found, it may be deduced that your dog has Old Dog Vestibular Disease. With many patients, I have a “wait and see approach” waiting to see if symptoms go away, worsen or get better while providing supportive care. Good nursing care can include providing a soft, secure place to rest and move (baby gates and interlocking foam tiles are wonderful), assistance getting up to go to the bathroom with slings or towels, and anti-nausea medication as well as a tasty diet and easy fluid access. Keep a journal for the family to detail the dog’s activities like ease of elimination, appetite, and severity of head tilt or circling. 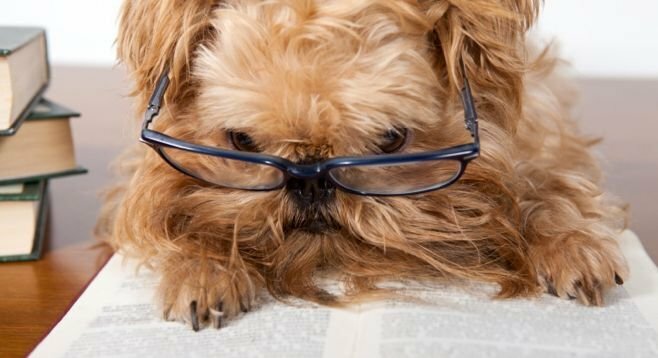 As always, knowledge is power and can help you and your veterinarian make better decisions regarding your dog’s care. In rare cases, Old Dog Vestibular Syndrome can lead to euthanasia. Some pets do not progress in symptom resolution, or a family is unable to care for the basic needs of a compromised pet. But take heart; most pets improve significantly over the first few days with the majority of symptoms resolving in two weeks. Some dogs may continue to have a slight head tilt or lean to one side. If your dog is not improving in this time frame, consider other diagnoses such as tumors, toxins, infectious diseases, or hypothyroidism. Next month … a fun little summer song to the tune of “Eye of the Tiger”. Yep, it will be worth the wait; my kids are already groaning with the first draft read-through. In The Welcome Waggin’ News: Dr. Lauri goes to Two Bostons in Naperville and Burr Ridge to offer microchipping! Sarah continues to improve her house! Gabapentin offered for arthritis pain relief! Dr. Lauri plans for a summer trip to Alaska! Dr. Lauri’s dog ruptures an ACL! Dr. Lisa goes to Spain with her mom to walk El Camino de Santiago de Compostela (66 miles over 10 days… checking off Mom’s bucket list item number #67). Dates worth remembering: Dr. Lisa on vacation June 15-25. Dr. Lauri on vacation July 17-July 31. Sarah on vacation July 20-29. There will be uninterrupted service during the summer. Dr. Lisa has Saturday appointments available on June 27th and July 18th.